Active Blue Dive Centre Kusadasi Turkey - ILSF Lifeguard training"
As well as diving courses, at Active Blue we also give International Life Saving Federation courses to Bronze, Silver and Gold levels, at our training facility adjacent to the dive centre. Completion of the course and gaining your certification, will give you the opportunity to work anywhere in the world, whether at a pool, park or beach, as this is an internationally recognized qualification. 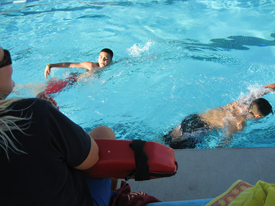 The only prerequisites for taking part in the lifeguard training are that you are 18 years of age or older and you must be a competent swimmer. Please contact the dive centre for further details.